I can't say how much I love and recommend the Shop Your Way rewards program (the rewards program for Sears, Lands' End, and Kmart)! I've had it for a few years now and have been able to get new clothing and other items for pennies without even shopping there on a regular basis (see links below for my other sweet scores). They often send free points to my inbox, just because. I celebrated a birthday last week, and excitingly, they added enough points to my card for it to be $10 off a $10 or more purchase at Sears. 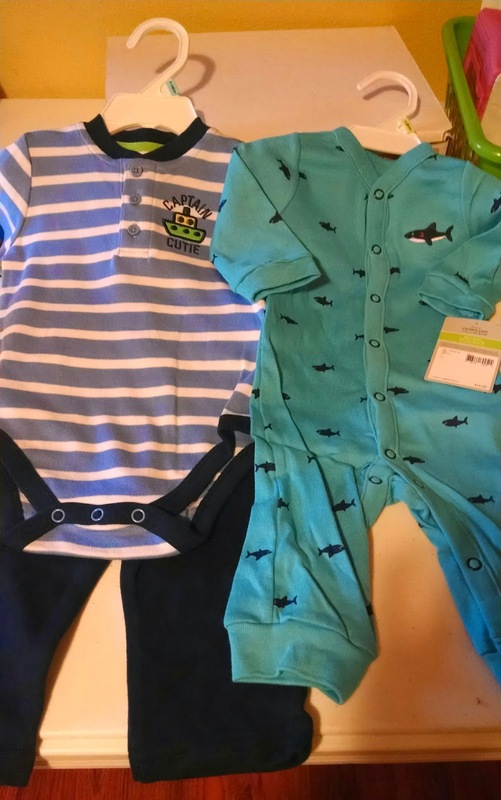 I shopped online and found two sweet outfits for our newest boy, due to arrive this Fall. I chose in-store pick up and paid $1.45 total for the outfits. After a few days, they e-mailed me to let me know my items had arrived at our local Sears. When I went to pick them up, I waited for five and a half minutes for them to be brought out to me (there was a timer going) and apparently the store's policy is that if a customer waits longer than 5 minutes for an online purchase to be brought to them, they get a free $5 off coupon for their next store purchase! Sure enough, the clerk brought out my 2 outfits plus the coupon! So I guess that makes my purchase a $3.55 moneymaker?! The coupon expires in September, so I'm waiting to see if something comes up that we need before I use it.